The anticipated late winter storm which was expected to drop several inches of snow today at Killington, Vermont, instead veered further east, with the edges only skirting the state. The resort received maybe an inch of snow in the early morning. This, of course, is on top of two feet of snowfall in the last two weeks and a foot the two weeks before that. Snowmaking at Killington stopped more than a month ago, said Michael Joseph, communications manager for the resort. Though the snow came late to Killington, it’s now “full on winter – wall to wall,” Joseph said, indicating all runs and lifts at the resort are open. It seems skiers on the east coast are accustomed to skiing on man-made snow and are finding the real snow a treat. Dave, a 69-year-old self-described Vermont farm boy and lifelong skier, called conditions at Killington this year, “the best it gets.” At least on the east coast, anyway, he added. With the storm bypassing Killington and the state of Vermont, it turned out to be a second glorious day of skiing, with some clouds and sun, temperatures in the 20s and – most importantly – beautiful packed powder. Killington is quite large, covering four mountains with 212 trails spread across 1,977 acres. Today we journeyed to the resort’s highest peak – Killington Peak – at 4,241 feet. I know it doesn’t sound like much to us west coast skiers accustomed to 10,000- and 11,000-foot peaks, but here it’s spectacular. Standing at the edge of the mountain, you can see 360 degrees. 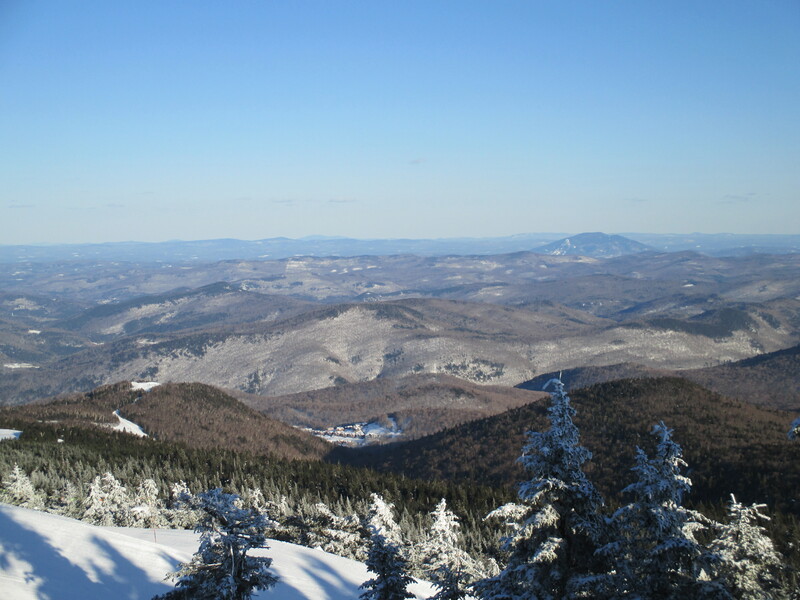 Skiers can take in the panoramic view of the Green, White and Adirondack mountains. A friendly skier and Vermont native pointed out Mount Washington, New Hampshire, in the distance and the nearby ski resorts of Okemo, Stratton and Pico. And you don’t have to be an expert skier to reach the top. All levels of ski terrain come off the peak. Now that’s a treat. This entry was posted in Killington, Marlene Greer, Vermont by Richard Irwin. Bookmark the permalink. Just a heads up for anyone reading this during or after the ’14-’15 ski season. There are no more Green trails from Killington Peak. Great Northern was changed to a Blue Square this year.